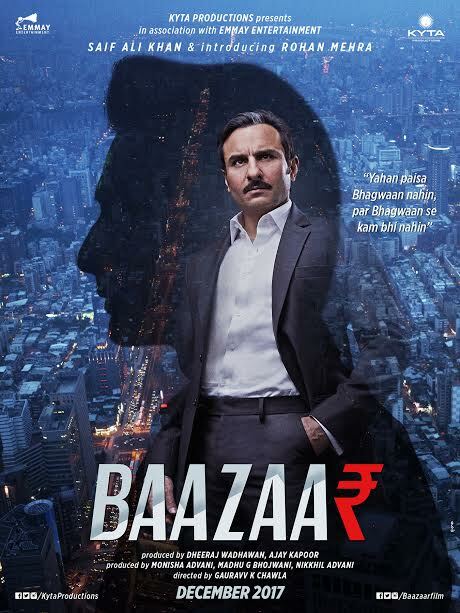 The producers Kyta Productions and Emmay Entertainment are extremely proud to announce their maiden co-production, Baazaar. The film’s principal photography commences this month and is slated for release in December 2017. KYTA Productions is a venture promoted by two exceptional minds coming together. Mr Dheeraj Wadhawan, with tremendously intense passion for Cinema & Mr Ajay Kapoor, with an impeccably terrific track record, stalwart in the Indian Entertainment industry involved with some of the biggest blockbusters of Indian cinema & this team is all set to storm the Motion Pictures & Entertainment industry. With an eye to create higher benchmarks & their relentless pursuit for excellence in the business, Ajay Kapoor is aggressively looking at acquiring & bringing on its board a wide range of cinematic content aimed towards bringing the next level of entertainment for the audiences in India & globally. Emmay Entertainment is a film production company based out of Mumbai. It has produced films such as DDAY, Hero, Katti Batti, Airlift and the upcoming Lucknow Central and Baazaar. In addition, it has also produced short format films such as Guddu Engineer, Shaadi Vaadi & All That. In television, it has produced POW Bandhi Yuddh Ke that aired as a limited series on Star Plus. The company is promoted by National Award winning director Nikkhil Advani, Madhu Bhojwani and Monisha Advani. Gauravv K Chawla has nearly a decade invested in assisting and leading directorial teams for films such as Patiala House, Dum Maaro Dum, Jhoom Barabar Jhoom, Chandni Chowk to China and Bluff Master. Also did 2nd Unit Direction for his films such as Patiala House, D-Day, Jai Ho & Hero. He has also directed Television commercials for various brands such has Etisalat, Pepsi, Bigg Boss etc. and music video’s for films such as Nautanki Sala. Having finished his schooling from Mayo College, Ajmer, Gauravv decided to pursue the world of Cinema during his college days. His foray into the world of cinema started with Ramesh Sippy Films, where he assisted and worked on all aspects with Rohan Sippy. From there, Gauravv gradually grew and worked with various production houses such as Yashraj Films & People Tree. He also worked on a few international TV Shows and films which were doing their production in Mumbai. Having worked with a few production houses, he finally made his base with Emmay Entertainment & Nikkhil Advani. Born on 7th May, in Mumbai. Mother, Kiran Mehra, from Mombasa, Kenya, 2nd generation Indian, father, Vinod Mehra, from Bombay, actor in Bollywood. Moved to Kenya when 6 months old, lived there till the age of 18. Then moved to UK to achieve higher degree education in BSc Mathematical Economics and Econometrics, at The University of Nottingham. President of the filmmaking society at the university, performed on stage at the university theater. Small stage music production, lead guitar player. Moved to Mumbai in 2012. Assited Sanjay Leela Bhansali, trained as an actor at Anupam Kher’s Actor Prepares for 6 months and then at The Jeff Goldberg Institute for a year. Trained in dance at the Danceworx Academy. Rohan has spent the past year as part of prep for the film by training in martial arts, dance & diction.